A smooth launch, a leisurely sail and a sunny sheltered marina made an auspicious beginning to the sailing season. The Easter break marks the first trip of this season for Aurora and we chose Suffolk again this year. 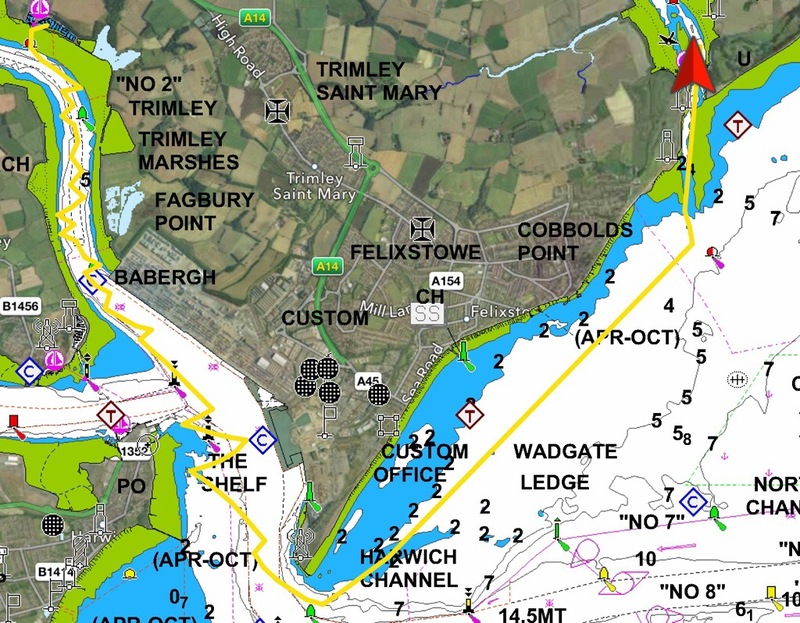 It can be very cold at this time and not everyone wants to be on the boat full time in the spring, so the attraction of Suffolk is the proximity of grandparents to provide an alternative to sailing. 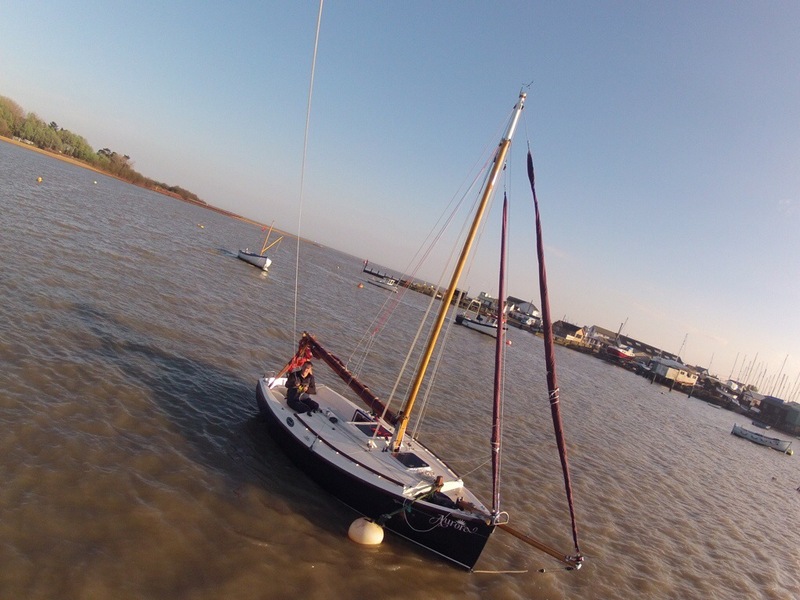 We launched from Suffolk Yacht Harbour, which is unusual in that their slipway has a wire which is used to lower boats down the slip. This may be unfamiliar to many, but we nearly always have to launch Aurora from a rope, so we got on well with this arrangement. I travelled with Aimee and rigged the boat yesterday. It was “blowing old boots” yesterday, so today was quite a contrast with light winds and much sun. The launch was easy, but there was quite a bit of faffing to do to get the trailer safely stashed away. Consequently, we did not sail off till midday. The wind was blowing almost straight down the Orwell and Aimee and I took it easy as we were carried out on a light air and a strong ebbing tide. We took the opportunity to check all the sails were properly rigged, that the furling worked properly and, where nevcessary, to adjust the rigging. This season, I have decided to use the genoa instead of the yankee. The latter is quite a bit smaller and more manageable, but when the breeze picks up, it soon needs to be furled. On the other hand, there seem to have been many occasions when conditions are very light for the yankee. Thus it seems as if the genoa would provide more power on very light days and yet seldom be a hindrance, compared to the smaller yankee. And so it proved today, at least. The wind was light and variable, swinging from fetch to run. On one occasion, Mr Honda was brought to life and a few puffs provided some excitement, but overall our progress was rather slow. Still, it was a nice day, and the combination of sun and sailing downwind was most pleasant. We watched Felxistowe docks and saw large container ships come and go. We watched the beach huts of Harwich drift past and saw the hidden entrance to Hamford water open up as if by magic as we followed the buoys. By this time the wind had died almost completely, so we motored slowly up Twizzle Creek to Titchmarsh marina. 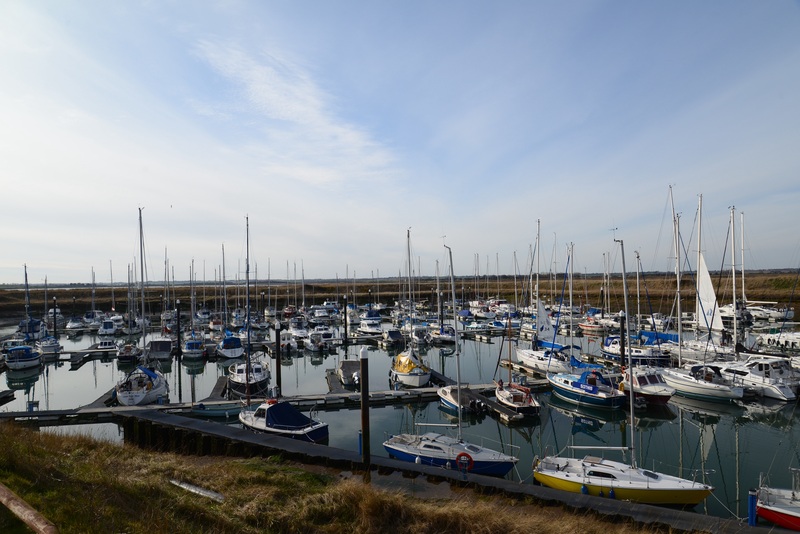 This marina is well tucked in behind the seaside resorts of Walton and Frinton. With the tide out, the boats appear as if they are sunken into the marsh. An embankment surrounds the marina and provides shelter, so after a (longish) walk to Walton, we enjoyed tea in the cockpit. As the sun drew near to the tops of the reeds and the almost full Easter moon rose, the chill in the air sent us down in the cabin. 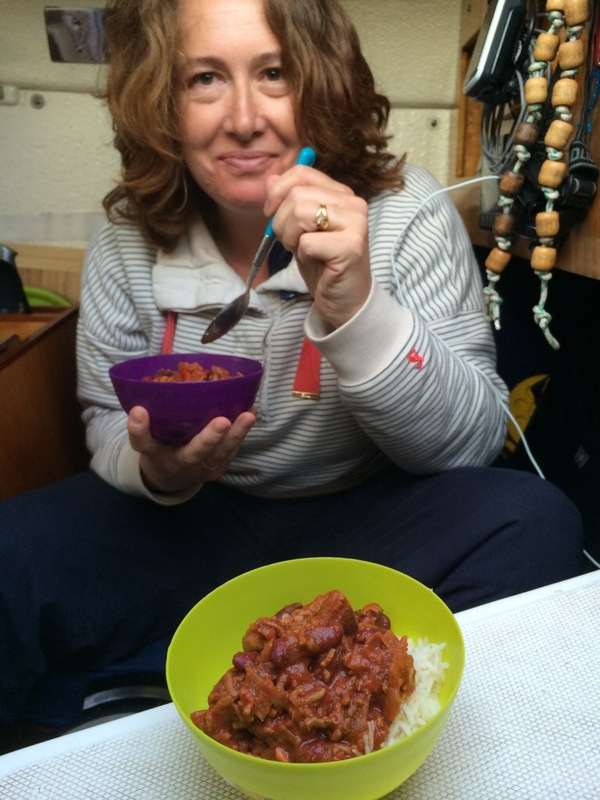 I was pleased with our evening meal- Moroccan lamb cooked in the thermal cooker (Aimee’s choice). 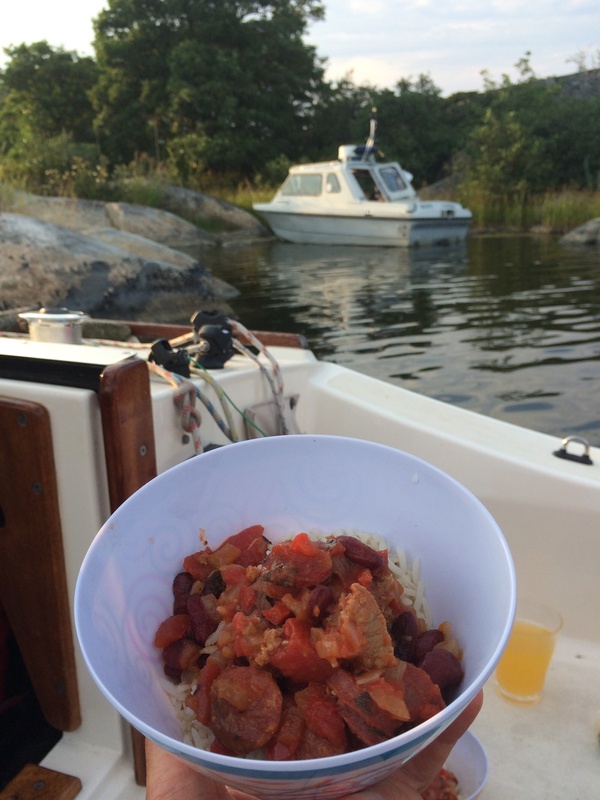 It was easy to prepare; tinned tomatoes, butter beans and linguine added to lamb, garlic onion and herbs. Aimee garnished hers with feta, but I passed on that. Trev and I were the only takers for an overnight trip today. 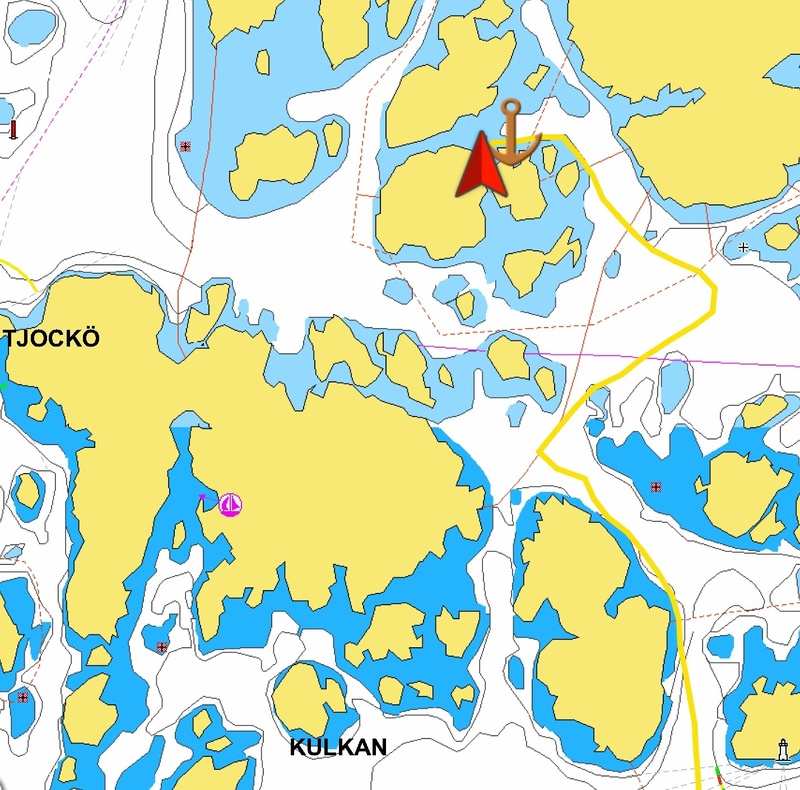 There were lots of suggestions for where we should go, but I decided to use the SW breeze to take us North to “Chocco” (Tjockö). After a bit of faffing (airing damp stuff, victualling and washing), Trev and I left Svartlöga. 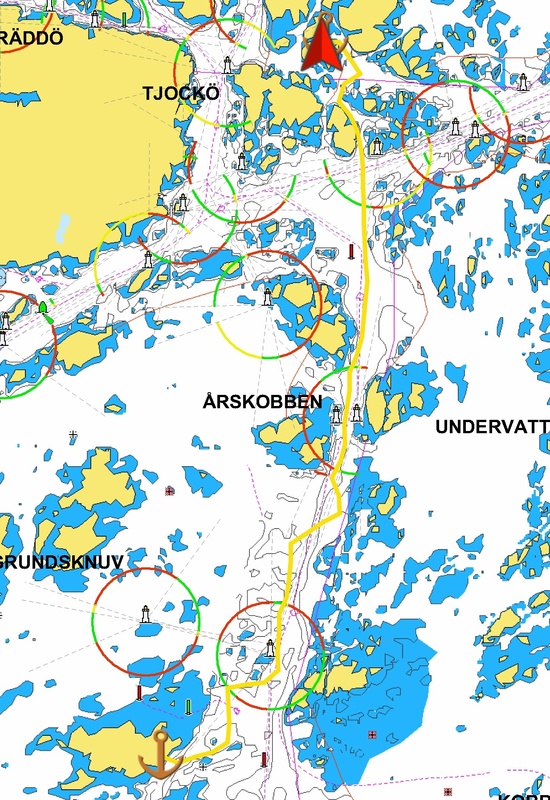 The wind was very nearly due South actually and we whizz end downwind, gybing over to the North-going channel between Svartlöga and Rödloga. The breeze built and built and we went from all three sails, to main and staysail and then, as our course was dead downwind, staysail only. even then we were travelling at an average of 4.5kt. There was a bit of trepidation when we crossed the E-W channel and a huge passenger ferry was beaming out of the East towards Norrtalje. Having avoided the shipping, we snuck into a narrow channel and passed some civilisation- a bar and restaurant, a marina, kayak hire, fish shop. Since we needed none of these (possibly the former, but did I mention that I did some victualling before departure?). After some exciting gybing through channels between small islands, we arrived at our target- a small natural anchorage, with excellent shelter from the southerly breeze. It took us a couple of goes, but we soon had Aurora with her bowsprit over the rock, one bow warp tied to a large rock and the other to a fallen tree. Trev and I perfected the disembarking procedure and went for a walk on the new island. The terrain is rather different here, as it has steeper and higher rocks. It also has more soil and therefore dense pine forest. This latter meant two things- firstly, there was not much of a view and secondly, there was a profusion of blueberries to be picked. This was serendipity in action, as I had not long mentioned to Trev how I would like some fruit and there was none aboard! After admiring some of the local boats in the deeper moorings, we retired to Aurora for some beer and nuts as an aperitif before our hot meal from the thermal cooker. Washing up done and bread for the morning made, we enjoyed a coffee in the cockpit as the sky turned from blue to orange with no sound but the breeze in the pines and the lapping of the water. 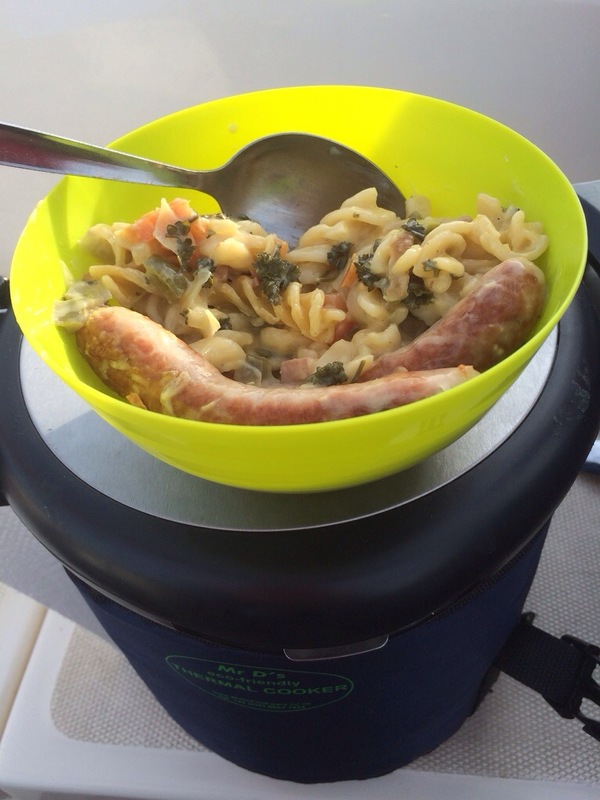 The thermal cooker has been a great success on this trip. We are away from shops and fresh produce much of the time. 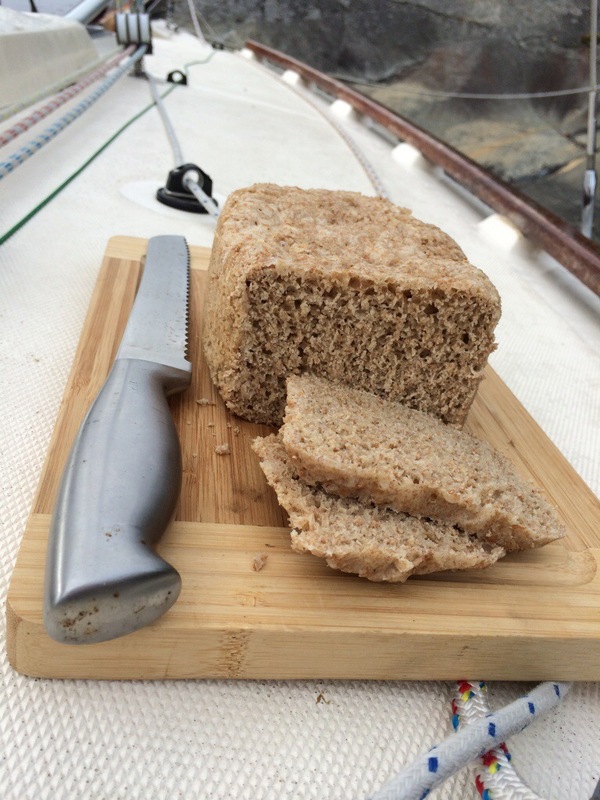 I love fresh bread and was determined to bring that bit of civilisation with us. I had experimented at home with the “no knead” bread recipe from Mr D and it worked well. So, I brought pre-weighed ingredients with me and can easily knock out a loaf; 10 mins to make, an hour to prove, 15 mins to cook and 4 hours in the thermal cooker. The only modification I have made to the recipe is to grease the tin with olive oil, as we have no fridge for butter. I made this loaf last night after we had washed up the thermal cooker from our lamb and chorizo casserole. Still hot after 10 hours! We had some lovely Worcestershire lamb left over from the roast and I thought this might combine well with chorizo. A red pepper, onion and garlic clove were finely chopped and fried off and the very rare roast lamb added. When the lamb was browned, I added half a chorizo, thinly sliced and two bay leaves. The dish was completed with a can of chopped tomatoes and a can of washed kidney beans. I also added a sprig of dried mint. This was simmered for a further 10 minutes, a top pan of rice prepared and both pans left in the thermal cooker outer for about 4 hours. A successful dish- slow cooking the lamb made it very tender and the spicy note of the chorizo, along with the subtle Ming flavour gave this dish it’s own character. Tonight’s feast afloat was a dhansak, made from my own spice mix, with fresh coriander, a big red chilli, creamed coconut, onion, green pepper, diced lamb and some chestnut mushrooms. Sauce thickened with corn flour before serving, because I forgot to bring some lentils. Served with basmati rice and sweet mango chutney. 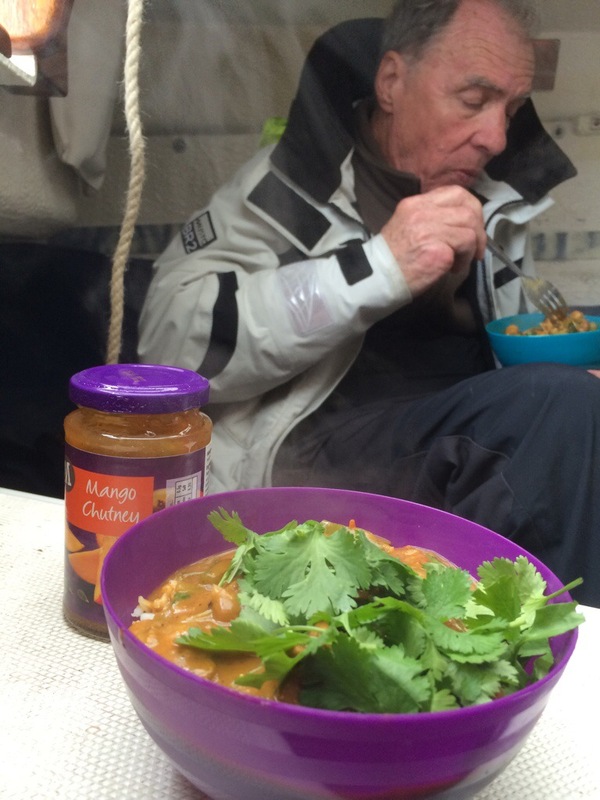 A much appreciated treat after a day’s sailing, though only 9/10 because it needed lemon or lime juice.